A friend of mine is rebuilding/restoring a 1905 Ross and needs a source of miscellaneous parts. Can anyone suggest some sources? Anothr suggestion would be to try to find one of the many "sporterized" Ross rifles floating around out there, as a donor. Mind you, if he is trying to restore one that has been sporterized, that won't help him much for any cut-down wood he needs. There is an outfit up here in Alberta who make semi-inlet stocks for a lot of old military rifles, including the Ross models (... also the "Long Lees" - i.e. Magazine Lee-Metford and Magazine Lee-Enfield - in case anyopne is is neeed need of wood for onw of those ...) but I'd have to track down their contact info. Yes, for restoration of '"sporterized" rifles, the parts commonly removed and discarded by Bubba are, of course, the hardest to find now! I do NOT recall the details, but IIRC, there were certain models of Ross rifles that, if the bolt was assembled incorrectly, THE BOLT COULD FLY BACK INTO THE SHOOTER'S FACE! Perhaps those familiar with the Ross can supply details. Thanks for the info!! If anyone has more info I would sure like to have it!! That was the case with the 1910 (Mark III) Ross (which was the final version, and standard issue going into WWI) but this potential hazard has been blown out of all proportion, since cases of it actually happening are virtually unheard of. 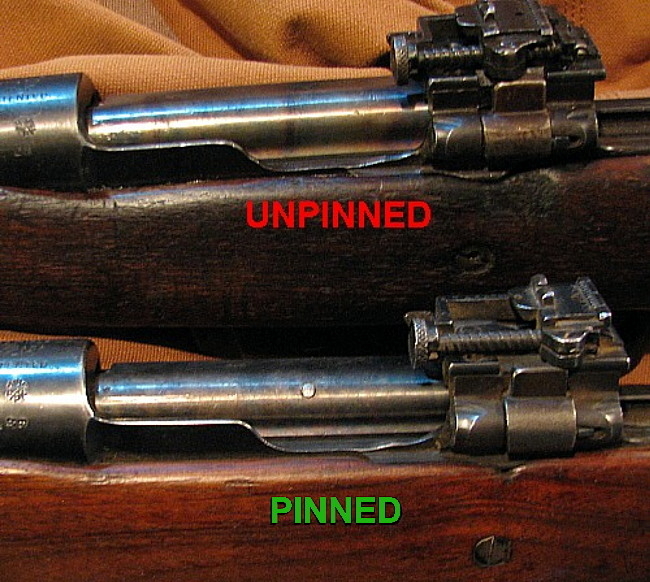 It should be noted that if this unlikely condition exists, the bolt does not fly right out of the rifle, but stops at the rearmost position of travel. In "The Ross Rifle, Monograph" produced after WWI for the Canadian government, its author Col A.F. Duguid noted that there was only one authenticated instance of a fatal injury to a firer of a Ross rifle. He also noted that during training of Canadian troops at Camp Valcartier, a total of 22,128 Ross Mk III rifles fired a total of 4,589,040 rounds with only one minor casualty recorded, that being from a blow-back. 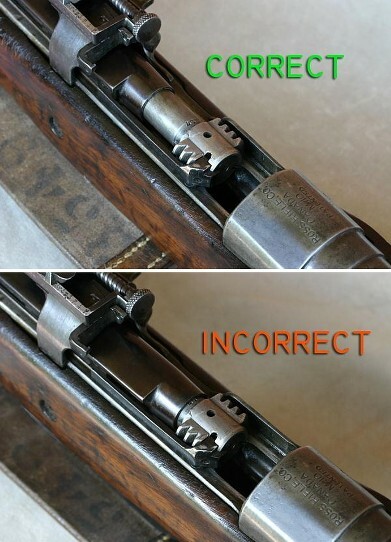 To put things into perspective: first off, it is rather difficult to actually reassemble the bolt incorrectly and still manage to get it back into the rifle, since it doesn't want to go back into its channel in that condiition, and you really have to work at it to get it in! Finally, Canadian military regulations in any event strictly prohibited the disassembly of a rifle bolt by anyone other than a certified armourer, so you'd have to be in breach of that rule to put yourself in any danger. The real problem with the Ross rifle, as a sporting rifle design modified for military use, was its exceptionally fine tolerances. It worked very well (and with exceptional accuracy) when clean and fired with correctly dimensioned cartridges. However, under trench warfare conditions, and with hastily mass-produced cartridges which were prone to being "out of spec", it was prone to jamming ... if not locking up almost irreversibly. The Ross has been referred to as "The finest target and sporting rifle to fail miserably as a battle rifle." I should perhaps add that my ability to instruct in "period correct profanities" alluded to by General Pitspitr arises from the occasion when I tried to use my Ross in the Era of Expansion match at a Muster. My problem on that occasion wasn't jamming in the chamber ... rather, the rifle was misfeeding so badly that I ended up having to shoot through using it as a single-shot! Howdy there Bull Schmitt, good to see youâ€™re still around. I havenâ€™t seen any of your posts in a while. Iâ€™m the guy thatâ€™s still trying to sell WASA but as you know itâ€™s a hard sell. Iâ€™m guessing that ECSASS is probably the only genuwine, voted on to accept WASA rules WASA club around. My motto unfortunately, â€˜There is no horse too dead that it canâ€™t be beat.â€� As to your topic. I handled an original Ross at a gun show in NC last year, the seller wanted 1000.00 but it had the bayonet for it too. Nice clean rifle but after I read up some on them I didnâ€™t jump. Have a good new year. Yep I am still around. Since SASS got too expensive and the rules too complicated and NCOWS doesn't seem to be active in Ohio I have not been to any matches in years. I miss the good old days! Having witnessed that performance, I will only add that it was quite entertaining! I would add that, according what I've read, a lot of the "low number Springfield" problems were also mostly caused by contract, war time ammunition failures. The brass used in some cases was much too soft. When the Army tested several of those rifles to destruction, the first blow up occurred with a fifty percent overload. I don't know how you'd even get enough rifle powder of the period into a .30-06 case to cause that! Speaking of bolt action operational difficulties, during one our BAM shoots last year at ECSASS a fellow shooter proceded to shoot the match with ammo that was a little out of spec and was forced to â€˜seatâ€™ his bullets by using the bolt handle. He would go to the line and at the beep beat his bolt closed with his right hand for just about every darn round. There was some colorful talking going on and of course his stage times could have been measured with an hourglass. He said that he had fun but I donâ€™t think so, the other troopers thought it was funny though. You know, Iâ€™ve noticed that in our sport we find great humor in the trials and tribulations of our fellow shootists.